Looking to update your hair color by going lighter? Read these tips from Wella Professionals Top Artist Alexandra Matiz first to prevent a hue snafu. How long do you want to sit in the salon? How often are you willing to maintain your new streaks? A full head of highlights and a glaze could take up to three hours, so you'll need to carve out a decent chunk of your schedule. And when it comes to upkeep, you'll need to choose between balayage and foil highlights. The difference is that balayage, or painting, gives a more natural effect. The highlights appear to be sun-kissed and seamless as opposed to synthetic, and there's no over-processing since once the formula dries, it stops lifting the hair color. The process is overall healthier for the hair and looks fine when it grows out, eliminating the need for a salon trip every few weeks. With foil, there's the risk of over-processing and damaging your strands since the foils will continue to lift the color until they're removed. 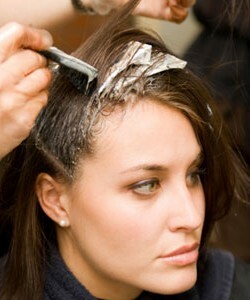 The highlights are executed in straight streaks, therefore needing to be touched-up more often. "One method isn't preferred over the other, but balayage is very in right now," says Matiz. "The trend these days is to recreate the kind of swept-in, natural highlights that you see on little kids near the summer's end." Even a few face-framing streaks will have a noticeable effect on how your complexion looks. Consultations with an expert stylist is key, which is why we highly suggest first-time highlighters to meet with one as opposed to trying to dye at home. "You want your skin to glow, not flash, with your new hair color," says Matiz. "Also, you don't want to rely on a ton of makeup to pull the color off." If your hair is damaged or virgin (aka never chemically processed), you'll need to take extra care and precaution. "I don't recommend those with virgin hair to stray too far away (two shades) from their natural hair color," says Matiz. The same goes for overly processed strands that have seen better days.